Today was the Ludi Votivi Decennales Pro Salute Augusti. Every ten years games would be held to honor Augustus Ceasar. On this day in 480 BC the Battle of Salamis occured between Persian and Greek forces. The Orionid Meteor Shower peaks tonight. The Moon is still nearly Full Moon, so she will interfere with viewing this year. In the Egyptian calandar on the 4th day of Koiak the Festival of Sobek is celebrated. Sobek was the Egyptian god of crocodiles, as is first mentioned in the Pyramid Texts. His worship lasted till Roman times, the people of Egypt worshiping him to gain his protection and strength, or reviling him and killing the crocodiles of the area because of the evil that they could do. To his worshipers, he was a god who created the Nile, a god of fertility and rebirth, and the symbolic strength of the ruler of Egypt. The Egyptians seemed to both respect and fear the power of the crocodile, and as the result of this, Sobek was seen as an ambivalent creature. Depicted either as a crocodile-headed man or as a full crocodile, Sobek was shown wearing a plumed headdress with a horned sun disk or the atef crown. In his hands he was shown to carry a was sceptre and the ankh sign of life. 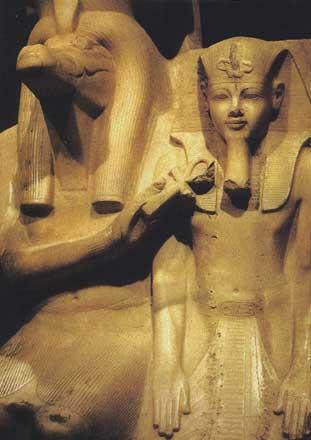 Originally, Sobek was probably a dark god who had to be appeased to give the people his protection against crocodiles. Sobek had a dark streak that stayed with him for the time he was worshiped. In The Book of the Dead, he was showed as four crocodiles who were believed to attack the deceased in the underworld. This dark side sometimes put him in the camp of Set. In one version of the tale of Osiris, Isis had to place Horus into a little boat of papyrus reeds to protect him from a menacing Sobek. His form of a crocodile - one of Set's creatures - linked him closely to the enemy of Horus. It was believed that Set turned himself into a crocodile to escape from Horus, and Sobek was punished for allowing this. In the Baha'i calendar, this day is celebrated as the birthday of the Bab, who would declare in 1844 that he was to prepare the way for Baha'u'llah, founder of the Baha'i faith. The Báb, or "the Gate", is the title assumed by Siyyid ‘Ali-Muhammad. This is one of eleven Holy Days in the Bahá’í calendar. The Báb is often refered to as the Herald of the Bahá’í Faith, because it was His mission to prepare the way for Bahá’u’lláh, the Founder of the Bahá’í Faith. The Báb, whose name was Siyyid ‘Alí-Muhammad, was the son of Siyyid Muhammad-Ridá, a mercer of Shíráz, and Fátimih-Bagum. Both parents were descendants of the Prophet Muhammad. He was born in 1819. Today is the feast day of St Artemius Megalomartyr (Artemios of Antioch; Artemois the Greatmartyr). Artemius was one of Roman Emperor Constantine the Great’s generals. During the reign of Julian the Apostate he became a fanatical Arian heretic, hunting and persecuting monks, nuns and bishops, including St Athanasius, but converted to orthodox Christianity and turned on pagans instead. Accused, in turn, by heathens of destroying idols, he was tortured and martyred.